Nuclear super weapons that Vladimir Putin claims can strike anywhere on the planet are being tested by Russia, military footage has revealed. Daunting images purport to show the latest round of tests for the missiles, which the military says are capable of wiping out an area ‘the size of Texas or France’. The RS-28 Sarmat missiles are capable of striking targets via both the North and South poles and can carry more nuclear warheads than any other missile on the planet, Russia claims. What's more, the RS-28 Sarmat missiles are able to deliver up to 24 of Russia's new Avangard hypersonic gliders, each of which can carry its own nuclear payload. There is currently no method of defence against the Avangard cruise missiles, which can allegedly travel at 20 times the speed of sound. Putin has said both Sarmat and Avangard will be combat-ready by 2020. 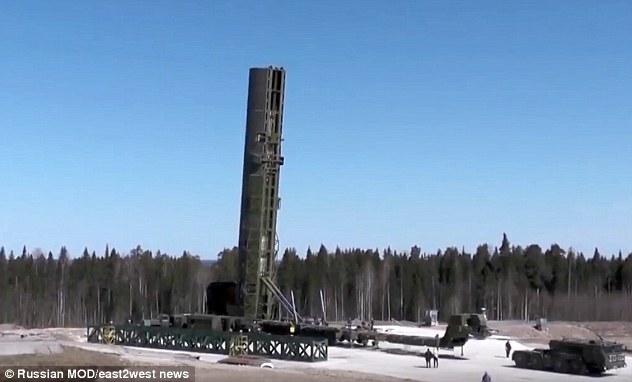 The video, released by the Russian Ministry of Defence, shows the bright checker coated RS-28 Sarmat missile, seen leaving its launch silo at a secret location in the Russian Federation. The liquid-fuelled, superheavy thermonuclear armed intercontinental ballistic missile (ICBM) was developed to replace the old SS-18 Satan missile. Sarmat 'allows the use of all types of individually targeted warheads, including those still on the drawing board,' said Russia's Strategic Missile Forces Commander, Colonel General Sergei Karatayev. It will be capable of unleashing ten large thermonuclear warheads or 16 smaller ones, or a combination of both, each of which is capable of being aimed to hit a different target. 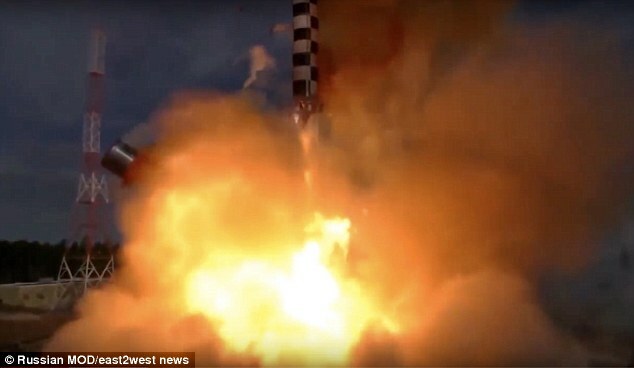 Russian Ministry of Defence run TV broadcaster Zvezda has previously claimed the missile will be able to wipe out parts of the Earth the size of Texas or France. It is also capable of carrying the Avangard glide vehicle, a hypersonic vehicle designed to sit atop of an (ICBM). Once launched, it uses aerodynamics to sail on top of the atmosphere. It is capable of making sharp twists and turns on its way to targets, making it ‘absolutely invulnerable to any missile defence system’. 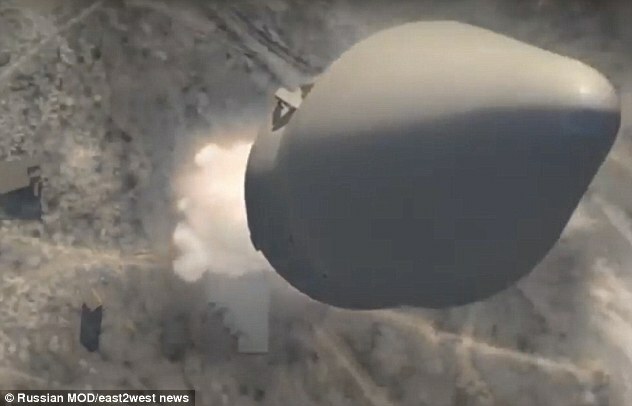 Speaking to MailOnline, Neil Gibson, senior weapons analyst for Jane’s by IHS Markit, said: 'I think the ability of hypersonic systems to defeat air-defence system is highly exaggerated. 'They have advantages and disadvantages as per any other weapon system. The fact is, the vast majority of ballistic missiles are already hypersonic anyway, it’s the controlled flight when still hypersonic that we are talking about here. 'If nuclear armed, they just come under 'mutually assured destruction' style posturing. Using them is always possible of course. Russia successfully tested Avangard twice in 2016, the sources claim. A third test in October 2017 failed when the platform crashed seconds before hitting its target, they said. But Moscow, which has been developing the weapon for three decades, remains on track to get ready for war in the next two years. Putin described his hypersonic arsenal as 'invincible' during a state-of-the-nation address in March. 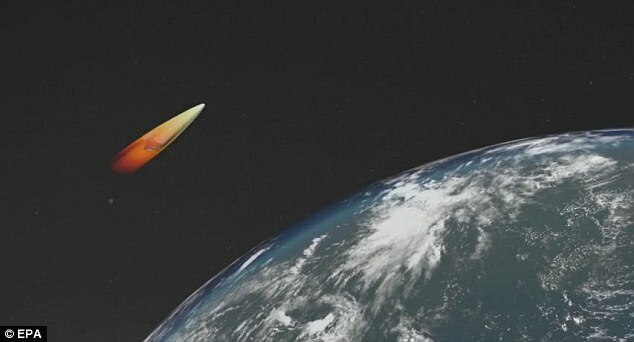 Standing in front of a large projection of computer generated missiles and simulated strikes on American soil, the former KGB agent said the hypersonic glider had already entered serial production. 'I want to tell all those who have fuelled the arms race over the last 15 years, sought to win unilateral advantages over Russia, introduced unlawful sanctions aimed to contain our country's development: You have failed to contain Russia,' Putin said. America's top nuclear commander said US forces are unable to defend against a hypersonic weapon during a speech in March. 'We don't have any defence that could deny the employment of such a weapon against us,' Air Force General John Hyten, commander of US Strategic Command, told lawmakers at the Senate Armed Services Committee.